A business catamaran day in the Mediterranean with private cruise and lunch aboard the catamaran. Share with your collaborators or customers a rafting activity and live a total immersion in the white waters of the Pays-Basque. Treat yourself to a sensational day in the Pyrenees with lunch in a restaurant in Saint Lary then trek via ferrata for 2 hours. 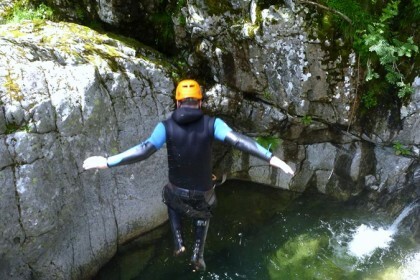 Go for a day Canyoning in the Pyrenees: jumps, swimming, walking, natural slides, climbing and abseiling. What are the different beach, sea, ocean team building activities suggested ? 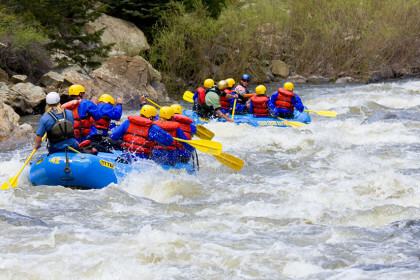 – Rafting team building : a “raft” is a big inflatable boat for 8 people maximum. 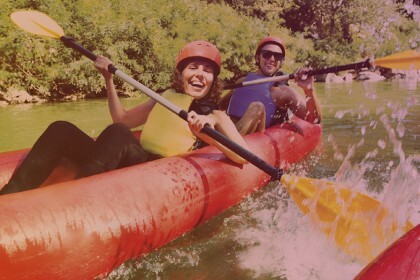 Propelled with a paddle, you will go down a river supervised by a professional guide at the back of the raft. This beach, sea, ocean team building activity will improve the cohesion, the harmony and the organization inside your team. You will share a convivial moment for sure. – Canoe-kayak team building : leaded by professionals, the participants will discover beautiful landscapes and sailing knacks all along this beach, sea, ocean team building activity. Canoe-kayak is an accessible sport for everybody. You will quickly make progress and share a pleasant moment with your team. – Canyoning team building : this beach, sea, ocean team building is a collective adventure included waterfalls, natural slides and rappelling descent surrounded by nature. The aim of canyoning is to improve the team cohesion, communication and adaptability. 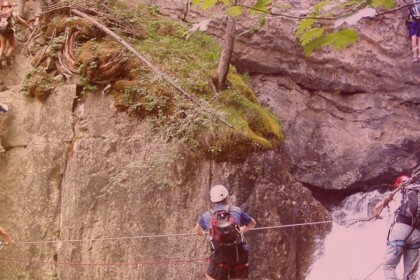 Our agency creates custom-made canyoning activity, adapted to every level. 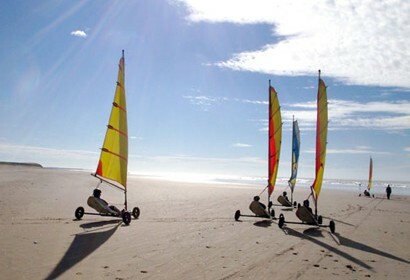 – Sand yacht team building : after an initiation on a delimit circuit, you will do a team relay race. Your sand yacht can go to 3 times the wind speed. This beach, sea, ocean team building activity is you made for every level. You will live unique feelings and share a funny moment. – Sailing team building : aboard a real sailing race, you will develop your team cohesion throughout this beach, sea, ocean team building activity. The sailing is a communicative and participative sport. The team members’ must be united and show order, organization and solidarity. 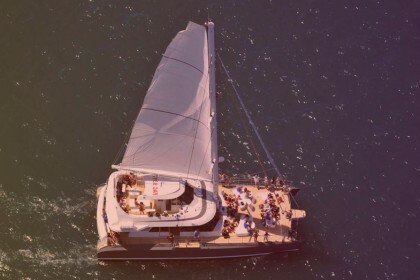 – Catamaran team building : this beach, sea, ocean team building activity is perfect to increase the team dynamics and to share a convivial, relaxed and discovery moment. The participants will enjoy a catamaran excursion on the sea included sunbathing, grilled food, walk and bathing. 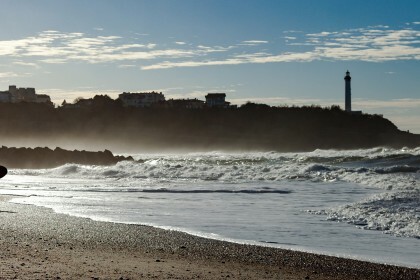 Where practice a beach, sea, ocean team building activity ? See where the wind takes you throughout beach, sea, ocean team building activities like rafting, canoe-kayak or dugout in French Pyrenees or Mediterranean Sea, do a under ice diving initiation in Andorra, go in Swiss, in Spain, in the United States, in Costa Rica, in Bali or in New Zeeland to practice canyoning with a midterm picnic. On the sea or the ocean, do a catamaran or canoe-kayak beach, sea, ocean team building activity. How many time a beach, sea, ocean team building is ? We suggests different options for your beach, sea, ocean team building : half a day, a whole day included picnic, weekend included accommodation, etc. Our offers are adjustable according to your requirements, your budget and your potential constraints. In order to improve the team cohesion and to get your employees closer in the professional context you have to show your recognition throughout relaxing activities like beach, sea, ocean team building. Some of our beach, sea, ocean team building offers are not on the website, if you want a personalized and tailored quote, according to your specifications, your needs, your desires, your potential constraints, and your requirements, you can contact us at 05 34 391 392 or via our quote request form. If you trust SOP Events, your beach, sea, ocean team building will be successful for sure !